That construction makes no sense at all. Why would you want people walking, and presumably driving, on solar panels? I admit I didn't watch the whole thing...have they even tried driving cars (and trucks) over that stuff? I mean, it's failing just being an installation, not even in practice. I've said it before, would hate to be caught on that kind of stuff in ice and snow. Simple wetness already seems crazy. Nikki Nyx wrote: That construction makes no sense at all. Why would you want people walking, and presumably driving, on solar panels? I admit I didn't watch the whole thing...have they even tried driving cars (and trucks) over that stuff? I mean, it's failing just being an installation, not even in practice. Someone walked on some asphalt one summer and said, "Wow this is hot! Think of all the solar power it's collecting! Imagine if we could harness that!" Unfortunately, there weren't any grownups around to explain to them why Solar Freaking Roadways is a bad idea. Thought #1: "We could use the solar energy to light up the road for traffic signs. That way we wouldn't need actual traffic signs anymore!" Problem: You can't light up the roads so they're bright enough to read during the day. The more complicated you make the roadway, the harder it will be to maintain. Programmable roadways leads to the potential of them being hacked and vandalised. Thought #2: "We have to have roadways anyways, why not make them solar collectors!" Problem: Roads are already problematic to build because of material cost and durability. You want roads that will be quick to build and won't need to be repaired or replaced for as long as possible. Replacing cheap durable materials with expensive less-durable materials is contrary to the purpose of building the roads in the first place. Thought #3: "But all the energy currently being absorbed by roads is going to waste!" Problem: So is all the energy currently being absorbed by our heads. Should be build solar collectors into our hats, too? Besides, not all the energy is being wasted; roads are built with the effect of the sun's energy already taken into account, to melt snow or evaporate rainwater. Removing that energy from the equation could lead to icy or slippery roadways. Gord wrote: Thought #3: "But all the energy currently being absorbed by roads is going to waste!" Problem: So is all the energy currently being absorbed by our heads. Should be build solar collectors into our hats, too? I vote we replace our heads with solar collectors. I was going to say that, but it seemed too stupid even for my own post. Ah, but when cars are both solar/electric powered and levitated - then no road wear occurs, so a solar strip might just be an option if for no reason other to keep the cars on track and not hovering over swimming pools. If there's no wear, there's no need for a road. But there's always wear. So maybe just strips of solar panels above which a laser beam is the roadway for those levitated swimming pool gawkers. Maintenance reduced to wiping up the soft drink spills and chewed gum residue. A solar panel on every utility pole! Nope. Too many people would become smarter. Where would the alt-med industry go after that? Nikki Nyx wrote: Nope. Too many people would become smarter. Where would the alt-med industry go after that? 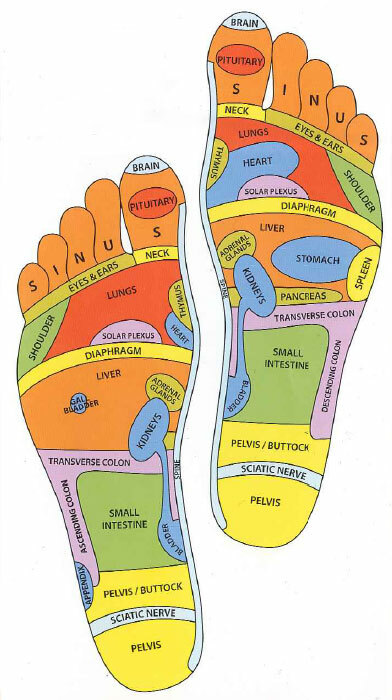 where, on the foot, do I have to massage to heal foot ache? According to Reflexology, that is impossible. For that you need a blind chicken. Nikki Nyx wrote: Foot fetishism. 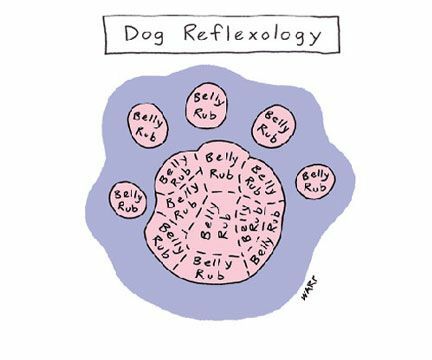 Reflexology. So that's where their brains are! "I've got more brains in my little finger than you have in both your big toes!" scrmbldggs wrote: To the dogs. That's where they're most ticklish. It's how I got my brother's dog to stand up -- she would lie down in passive resistance rather than do something she was told to do.